The Farmington Valley Quilter’s Guild invited me to visit their guild, so I drove down to the lovely town of Simsbury, Connecticut last week. I found quilting designs everywhere! This is part of the front door of the Simsbury 1820 House where I stayed. 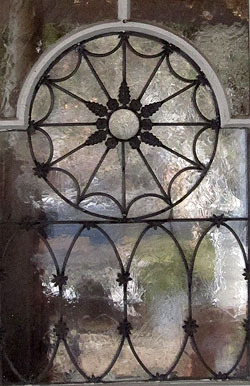 The guild meets in Eno Memorial Hall in Simsbury, which has architectural design inspiration everywhere – in the floors, walls, halls, and ceiling. Next time I am in the area I am going to revisit Eno Hall and take some photos. The Guild members were warm and welcoming, and during their meeting I enjoyed the ‘show and tell’ quilts shared by their diverse and talented members. I gave a trunk show with lots of my quilts and quilt tops, and talked about my love of machine quilting on my home sewing machine. I taught my ‘Fabulous Free Motion Fills‘ machine quilting workshop the next day to a great group of quilters from the Guild. We had a full and very fun day, talking about all types of background fill designs and answering lots of questions about machine quilting on a home sewing machine. 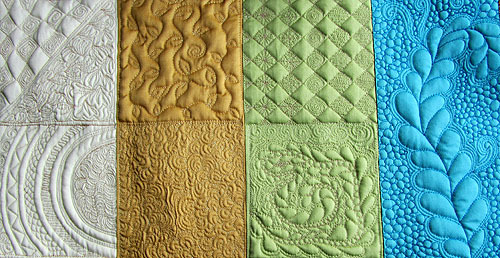 I discovered that many students from the workshop kept on quilting after class was over… and finished their samplers. Wow! Their work is beautiful, isn’t it!